ST GEORGE’S, Grenada--(BUSINESS WIRE)--A Memorandum of Understanding has been signed between the Ramaiah Medical College, Bangalore, India (RMC), and St George’s University, Grenada (SGU). 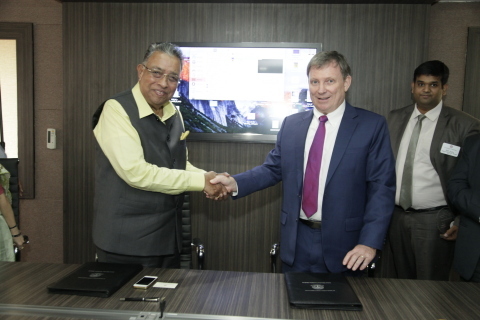 The signing took place during a ceremony at Ramaiah Medical College, held on Tuesday 20 March, and marked the beginning of a new international relationship between the two institutions. The purpose of the agreement is to develop academic and educational cooperation, and to promote mutual understanding between Ramaiah and SGU. The two institutions have agreed to develop collaborative activities in academic areas of mutual interest, paving the way for students of Ramaiah to study at SGU in future. A Joint Medical Degree Program is in development – to be launched in January of 2019 – wherein RMC will teach the first year of SGU’s five year medical programme to its students. Those who successfully meet the promotion requirements will continue the Doctor of Medicine programme in Grenada, or in the UK as part of the Keith B Taylor Global Scholars Programme – in partnership with Northumbria University. They will then complete their clinical training in the US, UK and Grenada. Commenting on the signing of the MOU, Dr G Richard Olds, President of SGU, said, “The breadth of this agreement is testament to the benefit it will bring to both institutions. A well-rounded medical education is the foundation of any successful doctor’s career, and international experience is an important component of that training. I am delighted that our students will have the opportunity to train at Ramaiah Medical College, and look forward to welcoming their students to our True Blue Campus”. Noting the benefits of international partnerships, Dr Naresh Shetty, President of the International Program at RMC, said, “The collaboration between Ramaiah and SGU will open up new frontiers for Indian students, who will be exposed to both Eastern and Western culture and benefit from a truly global perception of healthcare”. St. George’s University is a centre of international education, drawing students and faculty from 140 countries to the island of Grenada, West Indies. SGU is affiliated with educational institutions worldwide, including in the United States, the United Kingdom, Canada, Australia, and Ireland. SGU has contributed over 18,000 physicians, veterinarians, scientists, and public health and business professionals who are practicing across the world. The University programs are accredited and approved by many governing authorities. Ramaiah Medical College (RMC) was established in 1979 with the vision of providing quality education to all. The College is affiliated to the Rajiv Gandhi University of Health Sciences (RGUHS), Karnataka and is recognised by the Medical Council of India (MCI). To meet the need of training the next generation of doctors, the Ramaiah Medical College Hospital (RMCH) was set up on the campus in 1984. The Hospital accommodates 1,331 beds and offers all super specialties. The College is well-equipped with the latest infrastructure, technology-enabled classrooms and advanced laboratories, and continually focuses on teaching, clinical practice, and research.